This year for Earth Day, Earth Day Network is organizing a massive digital collection of images from around the world that show The Face of Climate Change. Change can be negative - floods, droughts, disappearing species - but it can also be positive – like the change wrought by activists and concerned citizens like you who are working to make things better. The images we collect will be part of an interactive digital display to be shown at Earth Day events all over the world. We know you are already acting around climate change, so this year, our Earth Day message is simple. Take some pictures. Share them with us. Don’t forget to tell us where your photos were taken and why they represent your face of climate change. The sooner you can get us the photos the better. The digital display is going live on Friday and we want YOU to help us populate our launch! We’ve shared a few pictures with you here in case you need any ideas. We’re looking for images that communicate about climate change by connecting it to faces, #faceofclimate signs, or clear stories about environmental solutions or problems. Please feel free to be as creative (or straightforward) as you like. We need everybody’s contributions. And hey, if you make a sign, why not recycle it by passing it to on to someone else so they can take a picture too! Share your faces of climate change with Earth Day and we’ll share them with the world. 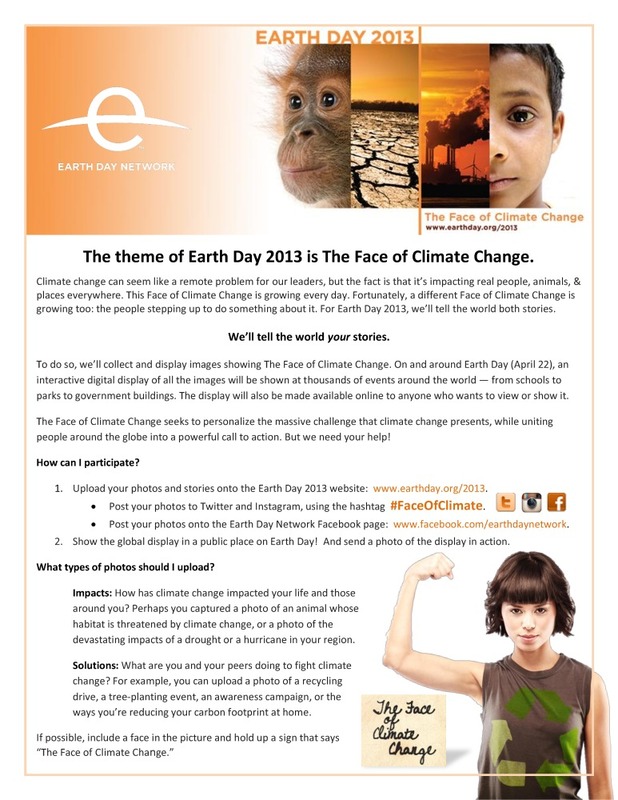 You can upload photos directly at www.earthday.org/2013 or you can find us and connect on Flickr at www.flickr.com/groups/faceofclimate.